These two recent White House Executive Orders (see below) seem rather mundane, but with a 7/10 and Pole Shift trained mindset, they seem to me like additional legal landscape to permit rapid, legally unhindered federal emergency response to enable 1) repairing and rebuilding infrastructure and 2) powering post 7/10 effected regions in the United States. Nearly 69% of U.S. crude oil imports originated from five countries in 2011 - Canada, Saudi Arabia, Mexico, Venezuela, and Nigeria http://www.eia.gov/todayinenergy/detail.cfm?id=5570 Most of the major U.S. oil refineries are located in Louisiana, Texas and California, areas that are expected to be casualties http://en.wikipedia.org/wiki/List_of_oil_refineries#United_States Note that the major crude oil transport pipelines within the continental United States are located in regions that are quite likely to be devastated by the 7/10 New Madrid earthquake/s. Canada supplies 2 million of the 9 to 10 million barrels a day of oil imported by the U.S. Even if just the oil transport nodes of Chicago, Houston and New Orleans go offline due to the 7/10 New Madrid events, then the entire U.S. oil transport network is dealt a devastating blow. As much as the US worried about being energy independent, matters will only get worse as the 7 of 10 plate movements create stress on the infrastructure within the US. 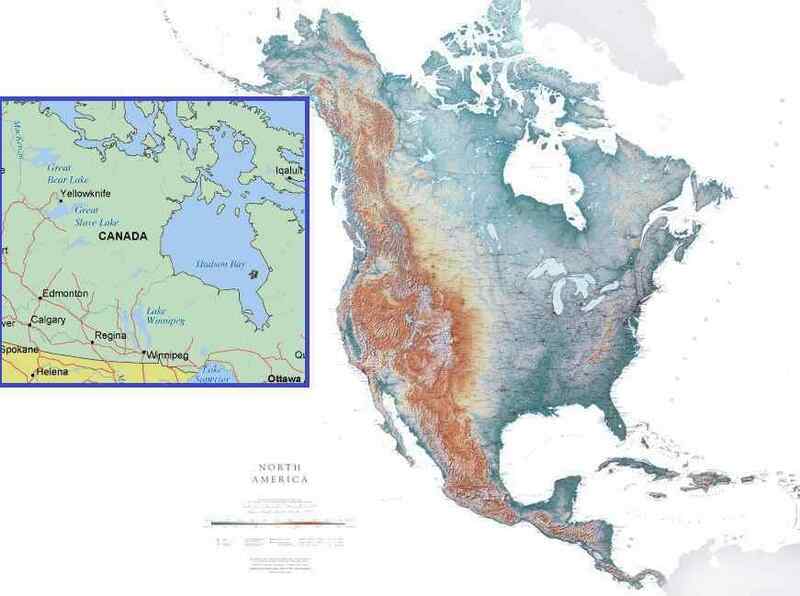 Already the bowing of the N American Plate is threatening to fracture pipelines and explode refineries. 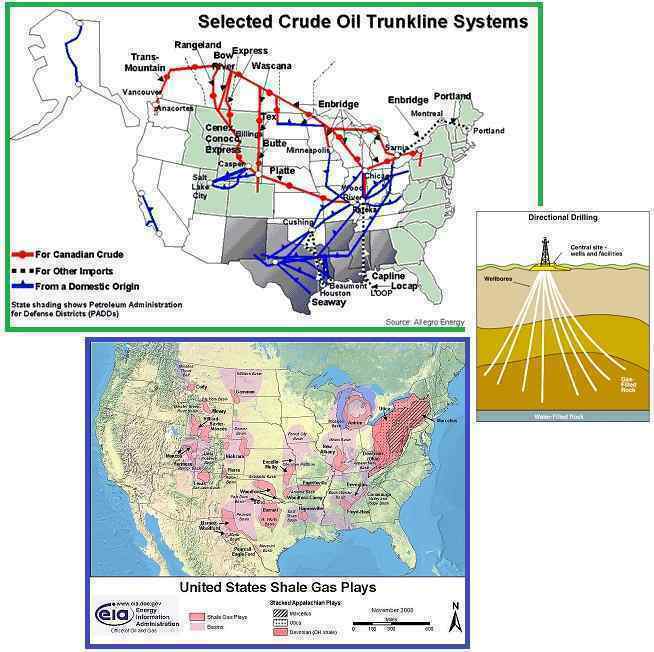 When the New Madrid adjustments tear bridges and pipelines along the Mississippi, and the great San Andreas shifts shortly thereafter, the oil and gas production and distribution within the US will be permanently damaged. The US government knows this, and under the quiet but determined direction of Obama has been scouting solutions to this crisis. The Bush administration’s answer to this threat was to invade Iraq, subsequently invade Iran, and make the Bush family and their cronies kings in the Aftertime when they would be in control of black gold – oil. Obama is a realist and has no intention of invading Venezuela or being an aggressor against Iran, as it is clear that the US is broke and unable to muster sympathy for their aggression from allies around the world. The proper course of action is to look inward, toward wind and water power, solar panels, and petrol energy resources within the US. Obama has been fostering growth in all these directions, from the start of his administration in 2009. How devastating will the anticipated earthquakes be? The New Madrid adjustment will obviously break the distribution pipelines coming from the Gulf, and in that the bridges across the Mississippi will be torn and land just to the west of the Mississippi dropped, all states east of the Mississippi will find their supply suddenly stopped. Of course, significant quakes leading into the big one will make this trend obvious. Other than attempt to store oil ahead of time, there is little that can be done about this sudden disruption. The fools in the Bush family, who were told by the lying Service-to-Self aliens that Houston would be a safe location, focused oil reserves in caverns on the Gulf coastline, near Houston. All that will shatter and leak. Supplies via Canada will survive the New Madrid adjustments, but as the booming in Wisconsin towns has shown, will not survive the tearing of the Seaway which will accompany the New Madrid adjustment. Thus, the East Coast of the US will find itself in a devastating energy crisis, which recent Executive Orders to facilitate gas production from coal deposits in the Appalachian mountains will do little to ease. This will be addressed by attempts to ship oil directly from the Gulf or the North Seas to newly built refineries on the East Coast, but none of this will ease the crisis. Natural gas is amenable to being piped, but not transported by truck or ship, and thus this crisis will be the greater. What will this mean to the US as a functioning economy, as a country in a temperate zone where home heating relies upon oil and increasingly on gas, and where the citizens have been encouraged, primarily by the Bush family, to drive bigger gas-guzzling cars and plow around in recreational cigar boats that are likewise gas-guzzlers? For those who note that we are hitting on the Bush family here, this is for a reason. Politicians that have leaned so heavily to the Service-to-Self spiritual orientation that they are virtual pawns of these visitors should be suspect. Those in the Service-to-Self lie, and their goal is to harvest as many souls as possible during the crises to come. Fear, a sense of hopelessness, anger at being deprived of what they have been told is the American Dream, the right to live high on the backs of others, all this impels a soul toward the Service-to-Self. The correct adjustment when the infrastructure is devastated, or when supplies get tight, is to cut back on selfish expectations and share what is available with others. Since all homes cannot be heated, moving in together so that one heated house can supply several families should be mandated. This will bring screams from everyone who has been told they should expect their own home, their own apartment, that this is their right. In decades past extended families lived together, the oldsters helping young mothers with their babies, and since this type of living will be the norm in the Aftertime, get used to it early. Large homes of the wealthy should be the first restricted in gas usage. Take in the masses or use fewer rooms. If despite Obama’s encouragement windmill and solar panel use within the US is still being neglected in preference to what some politicians following the Bush family leadership advise (“drill baby drill”), this is a matter that can be remedied relatively quickly. Constructing and erecting windmill farms would be faster than attempting to transport refined gasoline or heating oil by boat to the East Coast. Follow the lead of countries like Sweden, which have utilized wind power for decades. The US of course will not recover from the New Madrid and what is to follow along the West Coast. Howls of rage and demands will come from all sectors, a matter which, unfortunately, cannot be resolved by mere Executive Orders. A Korean-born American health expert Jim Yong Kim has been chosen as the new president of the World Bank, nominated by President Barack Obama. Is this too little and too late or is he likely to make a difference in terms of social justice as the world is now heading towards trouble times? [and from another] http://www.guardian.co.uk/business/2012/apr/15/jim-yong-kim-profile-world-bank Barack Obama put forward Jim Yong Kim as the United States's nominee for president of the World Bank, the pre-eminent multilateral development agency. Kim is all but certain to be approved by the bank's executive board. In any other year, the choice of a 52-year-old doctor who established innovative programmes to fight HIV-Aids and tuberculosis would have been applauded as progressive — especially as the bank's previous 11 presidents have all been white men. The difference is that this year, for the first time, the US nominee is being challenged by a strong candidate from the developing world, Nigeria's finance minister Ngozi Okonjo-Iweala. http://en.wikipedia.org/wiki/World_bank – Bush appointee Robert B. Zoellick (Bank executive with Goldman Sachs), Bush appointee Paul Wolfowitz (US Deputy Secretary of Defense), Clinton appointee Sir James Wolfensohn (Corporate lawyer and banker), Bush appointee Lewis T. Preston (Bank executive with J.P. Morgan). These were appointees certain to continue the New World Order desire to enslave developing countries by debt. Jim Yong Kim on the other hand has no cronies in the banking empires of the world, nor is he personally interested in enslaving mankind but rather being innovative to assist them. Like Obama, this man will be shielded from assassination attempts, which will surely follow, as those who are being denied their opportunities to control developing countries by debt will be enraged. Can the Zeta's comment on the "Dropped Quakes" blog posted here? : http://poleshift.ning.com/profiles/blogs/dropped-quakes This Array Network Facility website briefly showed 5 quakes ranging from mag 5-6 spanning across thousands of miles Canada’s Northwest Territories, Hudson Bay and Quebec from April 11-16 on three separate occasions. However, I could not find any additional information beyond the short time they were on this website to support they did happen. ie. twitters reports or any news reports. Also, I did not see any reports of these earthquakes on Canadas's ISM seismic network. It has been demonstrated that the USGS drops quakes or straight out fails to report them even when they were felt. Canada’s north is sparsely populated but a series of quakes this large over such a vast area would be very significant and news worthy and must have been felt by some if they did indeed happen. A French team used satellite data to show that glaciers in part of the Karakoram range, to the west of the Himalayan region, are putting on mass. The reason is unclear, as glaciers in other parts of the Himalayas are losing mass - which also is the global trend. [and from another] http://en.wikipedia.org/wiki/Karakoram The Karakoram is home to the highest concentration of peaks over eight kilometres (five miles) in height to be found anywhere on earth, including, the second highest peak of the world (8,611 m/28,251 ft). K2 is just 237 m (778 ft) lower than the 8,848 m (29,029 ft) tall Mount Everest. The range is about 500 km (311 mi) in length, and is the most heavily glaciated part of the world outside the polar regions. The Siachen Glacier at 70 km and the Biafo Glacier at 63 km rank as the world's second and third longest glaciers outside the polar regions. Why would ice and snow be building in the Karakoram range while decreasing elsewhere? There are several factors. India is pushing under the Himalayas, and rock scraping along rock releases heat, as the smoking crevasses near Everest show. Higher elevations usually escape such heat, as these mountains are riding atop the lower layers were subduction scraping occurs. There is also the issue of weather patterns, which change about because of the wobble. If water laden air is moving at high elevations, it will be encouraged to deposit its water there, as anything from dust in the air to objects such as mountain sides will cause condensation. Scientists looking at these puzzles are not looking broad enough, but using a narrow view, which is so often mankind’s error in these scientific matters. Assange is already in the cross-hairs of the big guns in the cover-ups, and is only alive because he is under a protection, as he knows. Blocked from releasing leaked material, and personally under assault by a false sexual harassment charge, he is doing what he can to lead the charge against disinformation and secret government operations. With a nose for relevant news, and an even better nose for lies and deception, he is hoping to start a trend. Will he succeed? How will the world block the RT news outlet? Attempt to “reason” with Russia? In the short term, his campaign will succeed. Is James Cameron investing in future space mining or is something more sinister going on here? Just seems like too many heavy hitters involved. [and from another] Is James Cameron launching an asteroid mining company? [Apr 18] http://news.yahoo.com/blogs/sideshow/james-cameron-launching-asteroid-mining-company-204737338.html A new company called Planetary Resources held its official launch today promising a new venture that would merge "space exploration and natural resources," while adding "trillions" of dollars to the global GDP. The company counts some heavy-hitters amongst its founders and financial backers, including filmmaker/explorer James Cameron, Google co-founders Larry Page and Eric Schmidt, Ross Perot Jr. Charles Simonyi, formerly of Microsoft. The group's somewhat vague press release has the site Technology Review thinking the new company's goal "sounds like asteroid mining." [and from another] Are Ross Perot Jr. and Google's Founders Launching a New Asteroid Mining Operation? [Apr 18] http://www.technologyreview.com/blog/mimssbits/27776/?p1=blogs An impressive array of backers are behind the new firm Planetary Resources. What are they up to? Certainly the expense of a space flight would not be justified by a mining effort. Space Guard and other government sponsored operations intent upon diverting the large moons of Planet X from a possible impact with Earth have long been in operation, but government funds have become scarce what with the global economic depression ongoing. Space Guard in any case has never figured out a way to divert incoming hunks of rock, despite the hype, as we explained to Jonathan Tate of Space Guard in 2001. Yet deflecting debris during the onslaught anticipated from the tail of Planet X is exactly what this crew is about. The wealthy normally mine and harvest public services from the taxpayers of the world, reserving their millions to enhance their personal comfort or amusement. They may claim they pay their fair share of taxes but the vast majority of public services is paid for and maintained by the common man. In fact, were the contributions of the rich to disappear, it would not even be noticed, such is their actually contributions. Meanwhile, worldwide, the rich get richer and the poor get poorer, as the rich buy influence among those who establish the laws and appoint judges. This is rarely called into question, this status quo, until a situation like the inbound Planet X and its threat to their precious lifestyles emerges. First, demands are made upon the governments of the world. When it is clear that the government cannot or will not provide the protection the wealthy think is their due, then they ponder taking matters into their own hands. Brandson’s Virgin Galactic has put into place an escape into space, but as the reality of the debris in the tail of Planet X has emerged in the form of fireballs and large debris visible to even the common man with a mere floppy disc insert, fear has gripped the tender bellies of the wealthy elite. What to do? Since they are under restrictions not to break the cover-up over the presence of Planet X, they must have excuses for building an apparatus to go forth into space. They are vague on the reasons, as anything they propose will seem ludicrous. There is no mineral worth the expense, as it already exists on Earth and can be mined there. Brandson is already offering space flights on Virgin Galactic, supposedly for entertainment, though escape from the surface of Earth during the hour of the Pole Shift is the reason. It is already obvious from Cameron’s trench curiosity that he is aware of our 7 of 10 predictions, and Brandson’s dive into the Puerto Rico trench is adding an explanation point to that. So without a valid excuse they can offer, and with a suspicious public casting a leary eye on their endeavor, they set forth to do .. what? They have no plan beyond getting a fleet of ships up where they can do .. something. Astrophysicists, who have conducted tests via probes landing on asteroids, don’t have a means of deflecting an asteroid, which merely continue on their original path after the attempt. Explosives don’t work either, as we also explained in sci.astro debates with Jonathan Tate of Space Guard, as the asteroid merely jumps away from the explosion. What the sci.astro debates showed, in excruciating clarity, is the tunnel vision that mankind often uses to explain why things work. A simple exercise we used during the debates showed that two math formulas – the inverse square law for gravity attraction and the centrifugal force law – could not be put together on the same page. Man cannot explain why the Moon remains in space and does not plunge to the ground. Have they learned anything in the last decade? Their arrogance has, if anything, increased. But one thing is clear. The wealthy elite are in the know about the inbound Planet X threat, and you, the common man, are being denied this information.